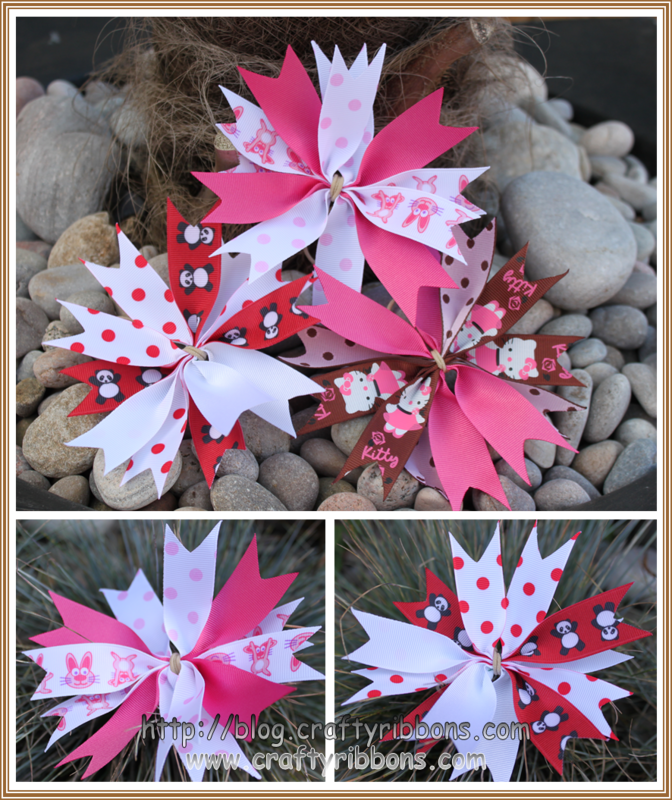 I have been meaning to do this project fro weeks, it was going to be a back to school idea! With Amanda and Anji both giving you hair grip designs, it was a push to get mine finished - sadly I had no little girl to model them for me!! My two little nieces would have been tucked up in bed by the time I finished these last night, so my garden came to the rescue this morning. What are they I hear you ask. 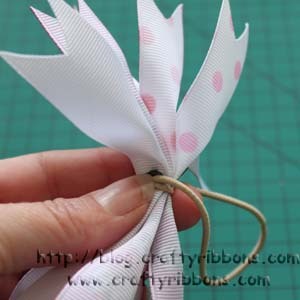 Elasticated hair bows or ribbon spikes. Mums of little girls will know all about the hair wars that go on at school. 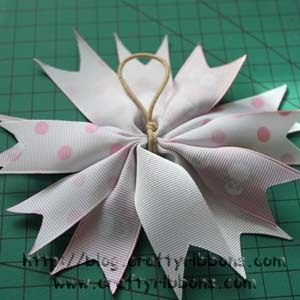 I just can not believe how quick these are to make - do you want me to show you? I have not done a tutorial for a while so here goes. 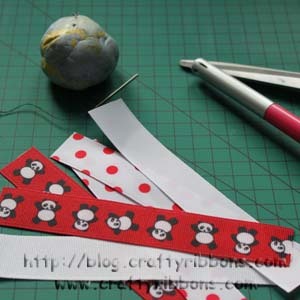 Get together the bits you will need for the bows - scissors, lighter, needle and thread, elasticated hair band, lump of blue tac and 6 pieces of ribbon about 15cm long. 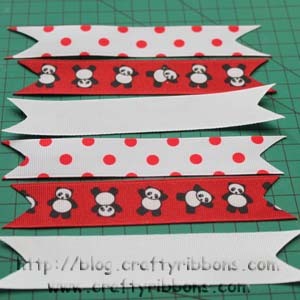 I used 25mm grosgrain Pandas which came from HERE, Dots from HERE and Plains from HERE. 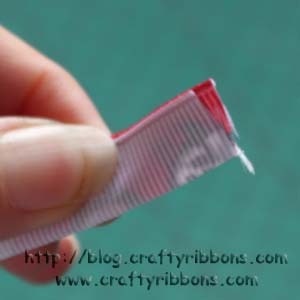 Fold the ribbon in half so the two raw edges meet. 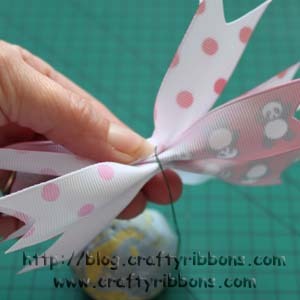 Fold the ribbon in half half widthwise this time. 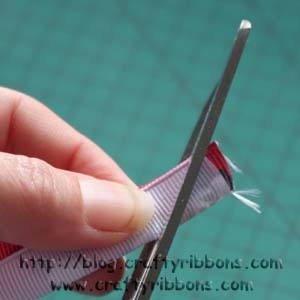 With a sharp pair of scissors (you are cutting through 4 layers of ribbon) cut the ribbon at an angle as shown. 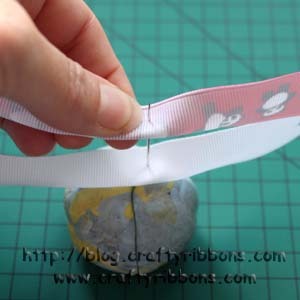 To stop the ribbon from fraying you ned to seal the edges. 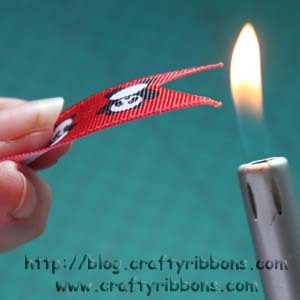 Just run a flame along the cut edge of the ribbon, just very quickly. repeat on all the ribbon spikes. Thread the needle and put a knot at the bottom of the thread. Insert the needle into a lump of blue tac or something similar. You just want the needle to stand up. 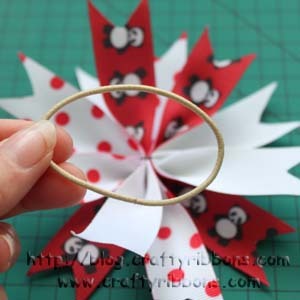 Fold the ribbon spikes in half widthwise in the centre and insert onto the needle. Repeat with all the ribbon spikes following the design you laid out. 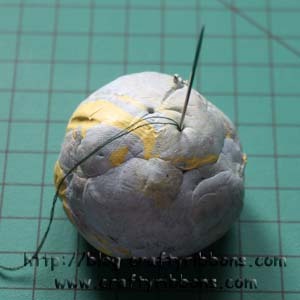 Pull the needle through the ribbon spikes and out of the blue tac, making sure you keep the ribbon squashed together. 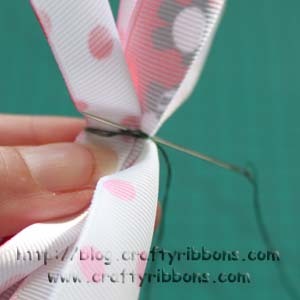 Wrap the thread around the ribbon a couple of times and secure with a stitch. Use thread that will match the ribbons, I used green so you could see it! 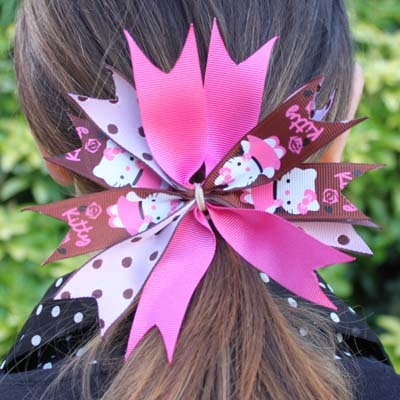 I could only get beige elasticed hair bands, but try if possible to get bands to match your ribbon bows. Wrap the elasticed hair band around the centre of the bow, to cover the thread, mine were rather large so I was able to knot the elastic - see below pic. 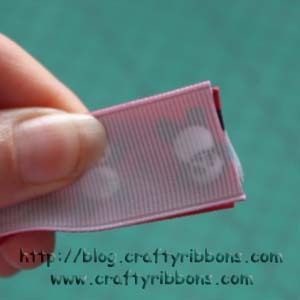 This then allows you to secure onto a pigtail! 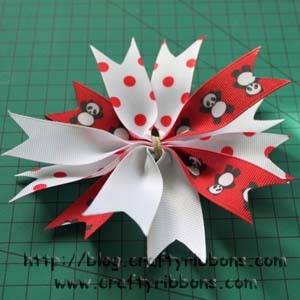 One finished ribbon spike hair bow. Ooooh I enjoyed making those and they are so simple. You can match them up with school uniforms, or outfits for weddings. i have a feeling when I show them to Sydney this afternoon I may even have to make smaller ones for winnie!